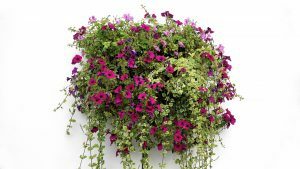 May is the time to plant up your hanging baskets and pots if you are doing your own. If you are anything like me you have lots of tender summer plants waiting to go outside. They need hardening off gradually by exposing them to the elements in the day and protecting them at night. I actually leave them protected all day on particularly cold days. If you are buying your pots or baskets already planted then make sure you buy them after all frosts have passed or protect them at night until you are sure they will survive outside. 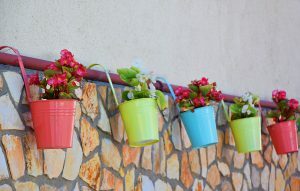 When planning your pots and baskets remember that they will need watering regularly (twice a day when it is hot). Larger pots and baskets dry out more slowly and terracotta pots that are not glazed dry out more quickly than glazed or plastic pots. The lawn should be growing really well now and looking lovely. The most important tasks now are mowing and edging the lawn regularly. Unfortunately if you are anything like me the weeds are also growing really fast. I find that the best way to deal with daisies and dandelions is to physically remove them with a daisy grubber. It is hard work but very effective. I do not worry about a bit of moss or clover. If you are very particular then you may need more extreme methods like lawn weedkillers but keeping a lawn free from all weeds is very hard work so consider what it is for. If you all play on it, like we do, then it will always be a bit rough and ready but still look gorgeous with the plants around it. 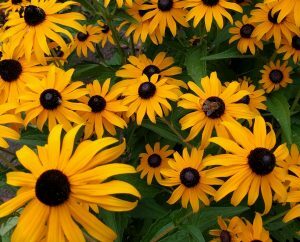 Perennials like rudbeckia, asters and phlox need supporting now before they start to flop all over the garden. Supporting them now allows them to keep growing naturally and the support to very quickly ‘disappear’ into the undergrowth. A stake can be used to tie the stems up to but link stakes are often the best support as they allow the plant to keep growing into a natural shape and not appear constrained. Grid supports can also be used in a similar way but these allow the stems to grow up through the grid. I have used all these methods and use a single stake for some plants but I love link stakes as I can use as many or as few as I like and they very quickly blend in. This may not be a task you are expecting to see in May but they still need a little bit of attention. 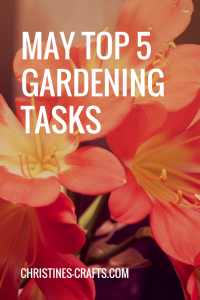 I included them in my March and April task lists. If you are lucky you will still have some spring bulbs in flower so enjoy them. As the bulbs finish make sure you remove the dead flower heads so that all the energy goes back into the bulb to produce more beautiful flowers next spring. 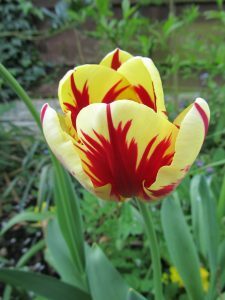 Do not cut off any of the foliage as the bulb needs it to prepare for next spring. You can remove the foliage as it dies back naturally. 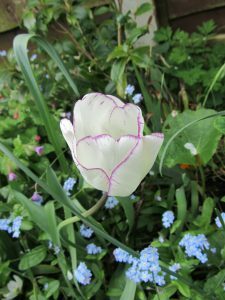 These are two of my tulips that are still blooming. It is not a glamorous task but it is really important at this time of year. Just as all your lovely plants are enjoying the warmer weather so are the weeds. You can hoe weeds off and this is best done on a hot day in the morning as the sun will make sure they die off. 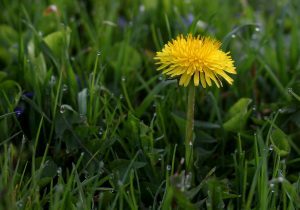 More persistent weeds (like dandelions) need digging out to make sure they do not keep coming. I am not a fan of weeding but it does give you an opportunity to have a good look around your garden. You can see how everything is doing. You might find some gems that you had forgotten about! So keep busy out there and most importantly enjoy it. Remember that gardening has been shown to be good for your mental health and well being. Of course, us gardeners already knew that! Any suggestions for other key tasks are gratefully received via the comments section below. You can always enjoy them when you are out and about. I love the really big baskets in public places!